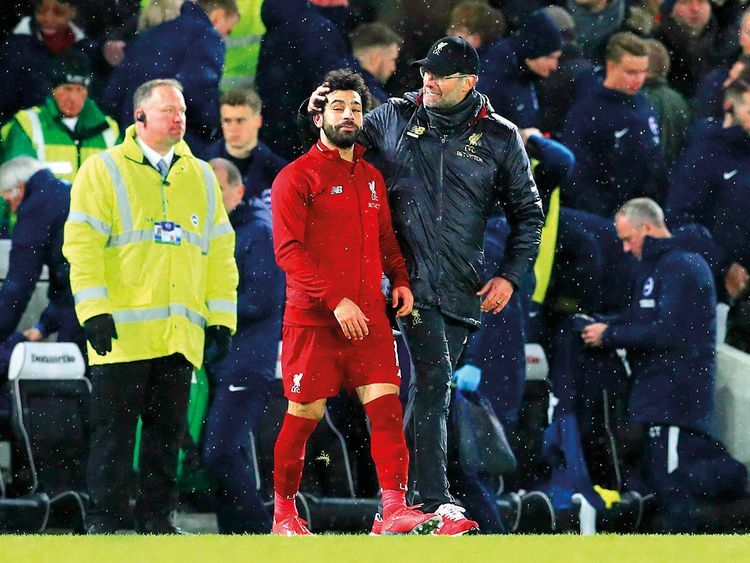 London: Mention the title to Klopp and he tends to go into meltdown but there are days and there are games when a 29-year-old dream sharpens into focus. Liverpool endured and enjoyed one of those days against Crystal Palace when their manager’s fist-pumping celebrations resurfaced long after he left the Anfield pitch to reinforce the point he is understandably averse to say. The countdown is under way. Liverpool did not perform like title favourites against Roy Hodgson’s dangerous side, who scored as many goals as 10 previous visiting teams to Anfield combined this season yet departed ruing their lack of points, fortune and goalkeeping options. The nature of Liverpool’s 19th victory in 23 league outings, a truly outstanding return, will not have been lost on Pep Guardiola, however. The single-minded pursuit of three more invaluable points, the breaks and the composure shown at 0-1 and 2-2 were not lost on Klopp either. Klopp’s team are in the phase of eking out victory by any means necessary and demonstrated again on Saturday how adept they are at it. Liverpool were reduced to 10 men in the 89th minute when James Milner was dismissed for a second bookable offence on his tormentor-in-chief, Wilfried Zaha. Makeshifts for the makeshift right-back arrived in the unlikely forms of Xherdan Shaqiri and Roberto Firmino, the latter eventually getting the job and an ear-bashing from Klopp for instinctively joining an attack at 3-2. “We had to react pretty quick and Bobby was a centre-half when he started playing, I remembered that at least, but of course it’s difficult,” his manager explained. Klopp will take advantage of an 11-day break before Liverpool’s next game by taking his squad to a warm-weather training camp in Dubai. His options at right-back are unlikely to improve against Leicester with Trent Alexander-Arnold and Joe Gomez injured, Milner suspended and Fabinho damaging his hamstring against Palace. Klopp is not expected to seek reinforcements for what he hopes will be a one-game problem. The Liverpool manager admitted: “I can imagine what people think about this situation but you have to make decisions in moments when decisions are on the table. That’s why Clyney (Nathaniel Clyne) is not here any more. In that moment we had plenty of options and now we don’t have them. Trent got an injury and it’s serious but not that serious. He will be back early but I don’t know if early enough for the next game. Maybe the game after.